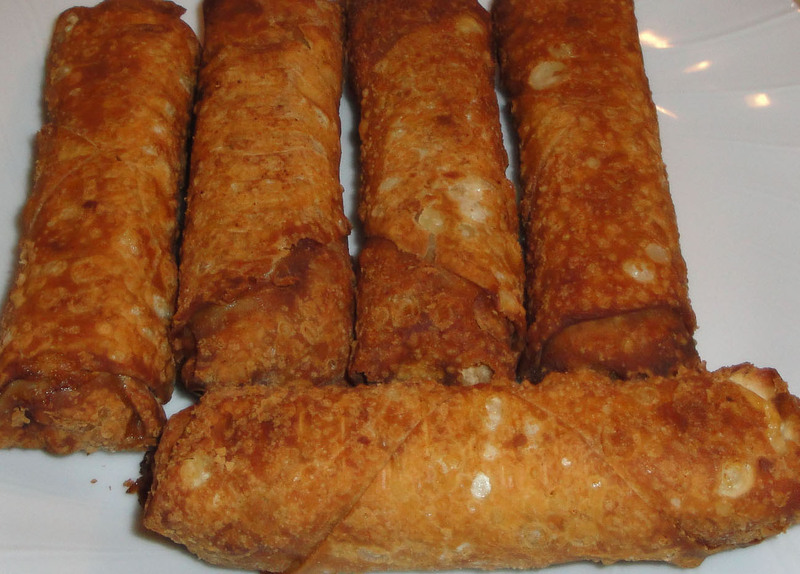 Egg rolls (and their lighter counterpart, spring rolls) date back to ancient China. Wonton (thin unleavened dough with fillings or as noodles) are a traditional part of the Chinese diet. It is quite likely that egg-roll type foods were made and consumed in the USA by the first Chinese settlers in the mid 1800's. It is also just as likely that most Americans never heard of them until about 50 years ago. Vietnamese spring rolls employ different tastes. Why are they called egg rolls? The dough is traditionally made with egg. Spring rolls are lighter, omitting the egg. Egg rolls are thin coverings of upraised dough, wrapped around various meat, seafood and vegetable mixtures, and then usually deep fried. Originally, these were special snacks served with tea when relatives and friends came to visit after Chinese New Year. Since the time was early spring, they came to be known as spring rolls...the egg roll, said to have originated in Canton and more familiar to Westerners, is larger...thicker. 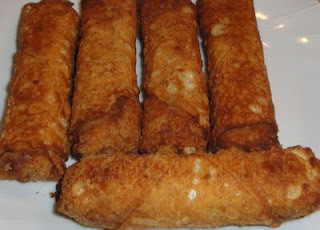 Egg rolls are served either as hors d'oevres or with dinner at any time of the year. Spring roll...An Asian-American appetizer made of crisp dough wrapped around a filling of various ingredients such as vegetables, meat, shrimp, and seasonings. Sometimes synonymous with "egg roll," it is considered somewhat more "authentic" and delicious than the latter. The name, which dates in English print to 1943, comes from the Chinese tradition of serving them on the first day of the Chinese New Year, which is also the first day of the lunar year's spring. Place just enough oil to cover bottom of skillet, over medium heat. Add ground pork, ginger, garlic powder, salt and pepper, cook until pork no longer pink. Cool slightly. Open and place slaw mix in a bowl, add pork, and gently toss. Place 1 egg roll wrapper on flat surface with one corner pointing toward you, lightly brush corners with water. Spoon about 1/3 cup of pork mixture in center of each egg roll wrapper. Fold bottom of corner of wrapper over filling.Then fold right and left corners over filling. Tightly roll filled end toward remaining corner, press gently to seal. In a deep fryer, add enough oil to a depth of 2 inches. Heat oil to 350 degrees. Fry egg rolls (cook in batches) about 2 to3 minutes or until golden brown. Remove from pan and drain on paper towels. Serve with soy sauce. Enjoy! I do not eat meat but I do love vegetable egg rolls, on an addictive level :) These look great! Christine, these look great! And thank you for the information about spring rolls and egg rolls. I always wondered the difference. :-) Thanks! The egg rolls look great. This is by far the most favorite my church family loves to eat! Yours look great, Christine! I love a good, crispy egg roll. The lighter the dough, the more happy I am. These look fantastic. Thanks for sharing the recipe. I love egg rolls. And I could easily eat 3 or more. Thanks for all the comments. I love to read them all... it makes my day. Christine...I've never attempted egg rolls. But these I'll have to try! They look delicious! These are always a favorite at gatherings. Yours look wonderful and crispy! I received one more tag game and it is about Easter Menu..I tag you and I hope that you will find time to participate! Hi Christine! I love the looks of your egg rolls. Thanks for visiting. It is great to get to know new bloggers. Will be back. I love egg rolls, they're hard to resist! Looks great and super easy to make ;) Yum! These look perfect! I'm definitely going to try them at my next party! 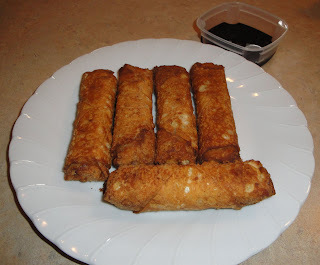 I love egg rolls -these look great! We love Asian food around our house. Your egg rolls look delicious. I love the history and trivia that you give with your recipes. Thank you for sharing them. You have a wonderful blog!